All tournament dates, times and details subject to change or cancellation without notice. If you have any questions regarding Woodbine Horseplayers Tournaments, contact Sue Clark. Don’t Forget! You must be an NHC Tour member to be eligible to win any seat to the NTRA National Horseplayers Championship. Gary Blair doesn’t consider himself among the top echelon of tournament players—but he’s working on it. The 60-year-old five-pin bowling centre manager from Toronto has a busy work schedule. Not unlike many of those in a leisure-based industry, it involves a lot of nights and weekends. Horse racing is his number one pastime, however, and he devotes much of his down time to carefully mapping out the plays that will be the foundation of his near-daily contest entries. Blair is a regular at all of the Woodbine onsite tournaments. In fact, he did well enough at this year’s four events to be a contender for the Woodbine Player of the Year Award right up until the very last race of September’s Woodbine Mile Horseplayers Tournament. Alas, he fell a little bit short of eventual winner Nick Noce. Though Blair’s tournament exploits extend far beyond the occasional live contest. He’s won his way in to many, including the National Horseplayers Championship (NHC), the Breeders’ Cup Betting Challenge (BCBC), the Kentucky Derby Betting Challenge, the Del Mar Handicapping Challenge, the Big One at Laurel and the top Woodbine tournaments. He has yet to break through and win one of those “majors” but that’s not due to a lack of effort. “If a given day’s tournament has 12 races, I’ll pull down the Brisnet past performances that are offered free at the contest site and probably spend about six hours studying those races along with the notes that I’ve compiled on those horses at my HPI [HorsePlayer Interactive] account,” Blair confessed. Some would call Blair’s preparations meticulous. Others might consider them unique or even a bit quirky—and not because of the amount of time spent. Unlike the typical handicapper who will study each horse in a race once, draw his conclusions for the race, and then move on to the next race, Blair focuses on one handicapping factor at a time, analyzing every horse on the card for that factor—distance changes, perhaps—then he’ll choose another factor…trainer’s winning percentage, for example…then go though each horse on the card for that. And so on, and so on. Lather. Rinse. Repeat. He’ll analyze about 10 different factors, which means he’ll go through each horse on a card, from beginning to end, 10 different times. He’s also a believer in tracking whether a horse takes an inordinate amount of money during the early, middle and/or late stages of the betting. Thanks to the wagering trend data available on HPI for horses at 20, 15, 10, five and zero minutes to post, he’ll note that too. Blair doesn’t just engage in such comprehensive analysis on the day before a big tournament. He does so on nearly every racing day for all of the tracks that are typically part of the contests he plays. His copious notes on horses sometimes allow him to play tournaments on the spur of the moment, but there’s a broader, more basic reason behind his predilection for study. He’ll generally try to come up with three top selections for each race, then sprinkle those top three picks across the five or six tournaments that he might be playing that day, hoping to gain solid traction with at least one or two of his entries. Perhaps surprisingly, it was only in the last two or three years, that Blair began devoting the bulk of his horse racing energies into contest play. Blair still feels like he has a lot of room for improvement in his game, though. He finds it hard to adjust his thinking on days when the track turns up sloppy—feeling reluctant to throw away hours of handicapping. On a more basic level, he finds weekend races more difficult than weekday play. Even when Blair’s handicapping yields more gutter balls than strikes, he makes it a point to remind himself that he’s never as bad as he looks on the days he goes “oh-fer” and he’s never good as he may look to some when he has a big day. That’s one piece of advice he has for prospective contest players. Another is to read as much as you can about tournament play…and to go online, look for the big names and check to see what they played. In recent years, it seems fair to assume that some of those reviewing the online picks of top contest players have been taking a long look at Gary Blair’s horses. And if not—they probably should be. 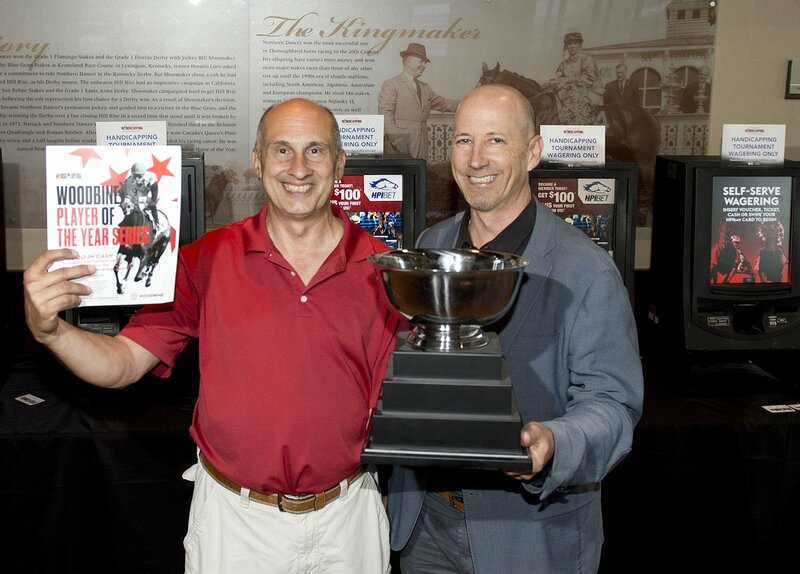 TORONTO, October 26, 2018 – When Nick Noce won the Mid-Summer Horseplayers Tournament in July, he knew he had established himself as a prime contender for the 2018 Player of the Year Award, which is based on overall performance over Woodbine’s four major handicapping tournaments. However, going into the final leg—the Woodbine Mile Horseplayers Tournament on September 15—Noce knew it wouldn’t be easy. James Metzger, a 35-year-old financial analyst from Louisville, Kentucky, had never been to Woodbine before. In fact, he almost never handicaps Woodbine when playing the simulcasts from Kentucky. Still, there were just enough little positives pointing in Metzger’s direction that he decided to give the September 15 handicapping contest a whirl. He liked the tournament format, which required five plays on the Woodbine Mile Day card of at least $400 each plus a play of at least half one’s bankroll on one of the two final races and, even though he was no expert on Woodbine racing, he liked that Woodbine was the only track that contestants could play. Whatever the reasons, the trip paid off. Metzger made an all-in win wager on 5-2 winner Oscar Performance in the Woodbine Mile to boost his bankroll, which had started for all players at $2,000, to $4,620. Then Metzger’s requisite “half-his-bankroll” bet turned out to be even more profitable when it included a $1,700 win wager on Johnny Bear, who captured the Northern Dancer Stakes at odds of 16-1. When the smoke cleared, Metzger had amassed a first-place total of $30,990, $14,815 more than his nearest competitor in the field of 51, Allan Schaffer. Metzger, like all players, got to keep his final bankroll total. He also received a $13,950 cash bonus for finishing first, plus a National Horseplayers Championship package (value: $5,600) and a Breeders’ Cup Betting Challenge entry (worth $13,100). His total winnings for the day: a gaudy $63,400. Metzger’s big cash scores of the past are somewhat surprising in one respect—he only bets horses to win. Another thing that Metzger hadn’t done—until 2014—is play in a tournament. That year, his friend Tim Schram—who runs the tournament division of Breeders’ Cup—convinced him to play in the Breeders’ Cup Betting Challenge (BCBC). Metzger didn’t have much luck there, but he thoroughly enjoyed himself and started playing the Keeneland tournaments on a regular basis. Metzger, who in his spare time manages a small Thoroughbred ownership syndicate called Russata Stable, creates a value line (basically what he considers to be a horse’s true odds of winning) for each race that he handicaps. The value line is based on his handicapping combined with workout information (but only if he is able to see the workout himself). The last piece of the puzzle for him is a visual inspection of the horse in the paddock to see if he or she looks especially good or bad. “I won’t bet on a horse I don’t think is good enough to contend just because he looks good in the paddock, but I will throw out contenders if I think they look bad in the paddock,” he said. Metzger traveled to Woodbine almost certain that he would be going all-in on Oscar Performance. Metzger was far less sure about the other horse that wound up putting him over the top—Johnny Bear in the Northern Dancer. Beyond his selection criteria, Metzger relies heavily on an aggressive approach—something he feels is important to contest veterans and newcomers, alike. Metzger was rewarded very handsomely, indeed, for his opinions in the Woodbine Mile Horseplayers Tournament. Also nicely rewarded were Allan Schaffer ($16,135 final bankroll), Tony Zhou ($13,650), Scott Carson ($8,513) and Nick Noce ($8,100). They finished in second through fifth places behind Metzger. Each received cash bonuses of between $6,975 and $1,953. Schaffer also won a BCBC entry while Zhou, Carson and Noce earned NHC spots for their Woodbine Mile Day efforts. Sheldon Usprech has always had a soft spot for Woodbine’s Weekend Horseplayers Tournament. 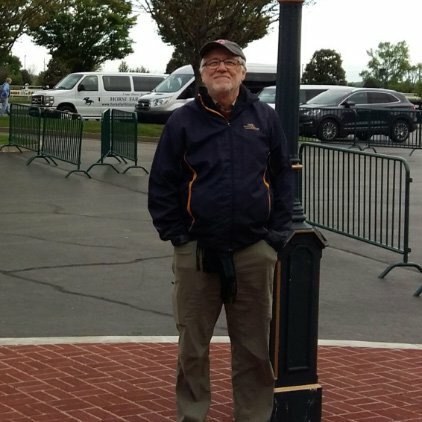 Since then, tournaments have grown in number and in stature at Woodbine—and Usprech’s stature in tournament circles has grown as well. On August 25-26, the 66-year-old retired school administrator and teacher from Toronto used three winning daily doubles as his springboard to victory in the 2018 renewal of the Weekend Horseplayers Tournament. The win meant $1,602 in cash plus a coveted $10,000 (U.S.) entry to November’s prestigious Breeders’ Cup Betting Challenge (BCBC) at Churchill Downs in Louisville. One BCBC entry and four berths to the National Horseplayers Championship (NHC) were up for grabs among the field of 99 entries and Usprech went in with a plan. Players were staked to a $50 live bankroll on Day 1 and had to make at least five $10 plays on races from the Saturday cards at Woodbine, Saratoga and Gulfstream. Scores carried over to Day 2, when players had another $50 added to their bankrolls and again had to make five plays across the three tracks, with the proviso that at least three plays each day had to be on Woodbine races. Usprech purchased two entries in the tournament and his better of the two had $71, from his starting stake of $50, after Day 1. That meant he started Day 2 with $121 once his second-day mandatory wagering amount was added in. The $121 gave him no better than middle-of-the-pack status entering Day 2, but that was fine with Usprech. “I just wanted to survive Day 1 and build up from there,” he reiterated. Happily for Usprech, after handicapping the Sunday races and reviewing the day’s Horsewin.ca sheets which he has come to trust since meeting their creator William White at the NHC a few years back, he found himself liking five or six Woodbine races a lot, and even found a couple of early races at Saratoga that he thought were playable. The tournament permitted players to make their choice of win, place, show, exactor and daily double wagers and for Usprech, the daily double option was key in that he could leverage his opinions so as to potentially win a lot without risking too great a chunk of his $121. He started off with the early double at Saratoga and, though he just played some $4 doubles, he stood to cash for $1,000 had his horse, Hidden Facts, won at 31-1. Alas, his longshot ran third. That opportunity came in the double connecting races 5 and 6 at Woodbine. Again playing in just $4 increments, Usprech hit a 15-1 morning line horse, Southern Greatness, that paid $35.40 to win, and he was alive to two horses in the 6th. One was the favorite and the other, Bet on Mike—a 12-1 shot, would mean a $1,200 windfall. Bet on Mike lost but the favorite, Slip Kid, came through, and that meant a nice $4 return of $250 that, to Usprech’s surprise, got him all the way up to 9th place with a total of $350. Now it was time for another daily double play! At first blush, race 8 didn’t seem like a fertile contest race given that there were only six horses and three were trained by Mark Casse. But then Usprech noticed one of his all-time favorite Woodbine trainer angles. “A Sid Attard trainee making his first start on Lasix and his second start for Attard,” he explained. The Attard horse, Wallace, won wire to wire, and Usprech’s selection of Aurora Way in race 9 also won, yielding a $2 Daily Double payoff of $226.20. Sticking with the $4 bet size that had worked for him earlier, Usprech added another $452.40 to his total. Feeling very confident now, the Torontonian went for another Daily Double score. This time, half the battle was already won, since the play hooked up Aurora Way with a Michael DePaulo-trained, Jesse Campbell-ridden horse named Code Warrior in the Seaway Stakes (race 10). Usprech watched as Code Warrior won wire to wire at 7-1. “It was almost too easy,” he laughed. Easy or not, Usprech had just added another $234.40 to his total, which was now up to $1,002.45. Suddenly he was leading the contest by some $30. Despite the run of good fortune, Usprech was far from giddy. “I’ve been here before,” he said to himself. His requisite bets having all been made, he then made the calculated decision to stop playing and force someone else to come and catch him. No one could. “One by one, they all just seemed to fall by the wayside,” he said. The four players who finished directly behind Usprech—Barry Kerbel ($861.50), Gary Blair ($625.75), Kenneth Zelin ($550.60) and Jack Dicenso ($191.05)—went home with very nice prizes as well. In addition to keeping their final bankroll totals, the quartet won berths to the 2019 National Horseplayers Championship (NHC) next February in Las Vegas. Oddly enough, Usprech actually had a chance to grab an NHC berth as well with his second entry. He bet on a horse in the final contest race at Gulfstream that would have gotten him up to fifth place and that last available NHC seat, but it wasn’t to be. Still, he couldn’t have been happier with how the weekend played out. That’s a problem we’d all like to have. 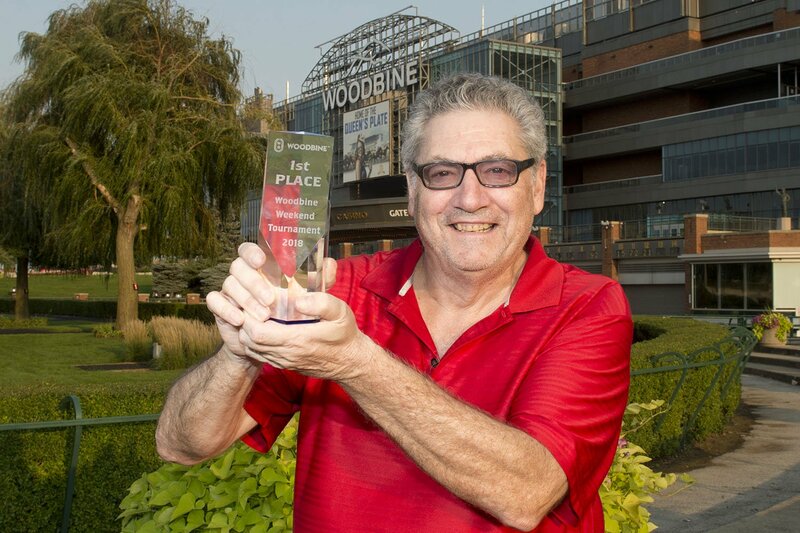 TORONTO, July 27, 2018 – Nick Noce has always been fond of Woodbine, especially after winning a 2012 tournament here that netted him his first and only berth in the National Horseplayers Championship (NHC). That devotion to Woodbine racing likely deepened quite a bit on July 21 when the former Western Regional OTB Chief Financial Officer from Rochester, New York finished first of 106 entries in Woodbine’s Mid-Summer Horseplayers Tournament. The triumph meant $2,115 in prize money for Noce, 61, along with his final bankroll amount of $1,659—plus a return trip to the NHC next February. “I just love Woodbine. I don’t usually miss one of their tournaments,” said Noce, who first began playing contests at Penn National in the 1990s. When Penn National discontinued those events, Noce took a contest “hiatus.” But he rediscovered tournament play in 2010 at Woodbine, which is only a three-hour drive from Rochester. Always liking to increase his chances for success provided that the entry fee is reasonable, Noce purchased three entries (the maximum permitted) for the Mid-Summer Tournament at $250 each, and two of those went bust in relatively short order. With his other entry, Noce made the bold decision to bet his entire $100 starting live bankroll on No Dozing, a 6-1 shot in the 3rd race at Saratoga. When No Dozing won and paid $15.40 to win, Noce found himself in the lead with $770. He was soon passed, though, by Toronto contest stalwart Allan Schaffer, who risked $60 to win in Woodbine’s 4th race on Carmenootz, who won and paid a whopping $52.90, giving Schaffer $1,567—more than twice what Noce had. After Noce suffered $110 in losses, it was time for another bold move. He bet his entire remaining bankroll of $660 to win on the Steve Asmussen-trained Nitrous, who won the 6th race at Saratoga and paid $3.70. With five races left at the two contest tracks (Woodbine and Saratoga), Noce found himself in third-place with $1,146, and there were pursuers behind him nipping closely at his heels. A self-professed “weekend warrior” who doesn’t typically bet big money, Noce swallowed hard and told himself, “When you get this close, you have to go for it.” He decided that if he was going to reach his goal of a return trip to the NHC, it was time for one more all-in plunge—this time on the Chad Brown-trained Sistercharlie in the 10th race at Saratoga, the Diana Stakes. Two NHC seats were on offer at Woodbine, and Noce was only $180 out of second-place. So he decided to add an element of safety to his play. He put his $1,146 on Sistercharlie to place, rather than to win. Capitalizing on his accounting background, Noce had calculated that Sistercharlie would pay about $2.50 to place and that would be good enough to move him up into that coveted second-place position. Sistercharlie wound up winning by a nose, but Noce wasn’t disappointed that he bet to place and not to win. “It saved me from having a heart attack in the stretch,” he laughed. There was more good news, however: Finishing second to Sistercharlie was the longest shot in the field. That meant a place payoff of $2.90 rather than the $2.50 that Noce had forecast. He was now all the way up in first-place with $1,659. Perhaps having had his fill of boldness for one day, Noce decided to sit on his lead and make someone catch him. No one could. Allan Schaffer finished second and grabbed the other available NHC seat. Laurance Salvati finished third. Nick Noce has always been a racing fan, but the Rochester, New York resident also had, for 25 years, the pleasure of working in the racing industry. 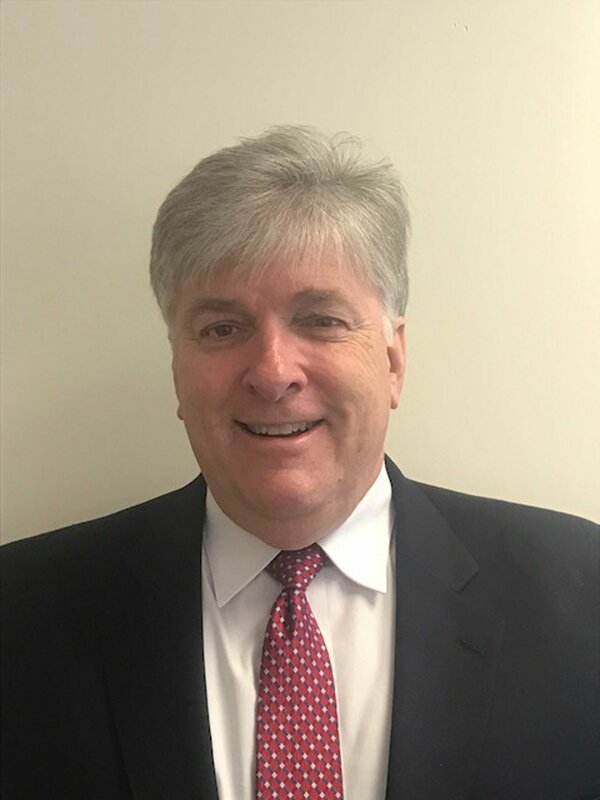 He started out at Western Regional Off-Track Betting selling parimutuel tickets to Western New York State horseplayers, and he eventually worked his way up to branch manager and, later, Chief Financial Officer. For the last 13 years, Noce has worked at the Monroe County (N.Y.) Water Authority, where he now serves as the organization’s Executive Director. Despite his heavy workload, or perhaps because of it, Noce still looks for any opportunity to spend a day playing the races. Typically that means heading to his local Western OTB branch where he cheerfully pays the five per cent surcharge on winnings that so many of his New York horseplaying brethren bemoan. “I was there for so long, and now my son T.J. works for Western OTB as a staff accountant…so I look at the surcharge as ‘paying it forward,’” Noce laughed. While Noce doesn’t mind taking a five per cent haircut at Western OTB, at the track, he’s all about value. “You wouldn’t know it from how I played last Saturday at Woodbine, but I very rarely bet chalk,” he said. “I don’t like to bet horses under 5-1. To find those horses, I try not to look just at the top line [of the past performances]. I like to go back three or four lines and see if the horse did something good that others might overlook. His advice to new contest players is a bit less analytical. Another great experience Noce is looking forward to is representing Woodbine at next February’s NHC. TORONTO, July 6, 2018 – Russell Wilkes had attended tournaments for years—but not as a contestant. Whether at Woodbine, in Las Vegas or in places in between, Wilkes delighted in tagging along and cheering on his longtime friend Bob Montgomery (winner of this year’s Horse Player World Series) as he followed the contest circuit. Despite Montgomery’s frequent prodding, however, Wilkes never, himself, played in a tournament. Wilkes, a recently retired liquor store manager from Stittsville, Ontario, finally played his first tournament in August 2016, but only due to a sizable assist from Montgomery. “Bob paid for my entry that day,” Wilkes, 58, laughed. Wilkes finished second that day, and the result encouraged him to stick his toe a little deeper into the tournament waters. Later that year, he played in the Orleans Fall Classic in Las Vegas and finished second there as well, this time earning $20,000, an amount that still represents his biggest winnings as a contest player. Wilkes did just that earlier this year, winning a $3,000 entry at Horsetourneys.com to the Keeneland Grade I Gamble tourney in April. After having tasted success in mythical-money tournaments like the Orleans Fall Classic and others online, the 58-year-old looked forward to trying his hand at a prestigious, live-bankroll event. The official was not bearing good news. For failing to adhere to the $200 minimum, Wilkes had been disqualified. So a difficult psychological blow turned out to be a financial saving grace, and for Wilkes it was just another chapter in what has already been a pretty unforgettable 2018. On March 23, he won his first ever seat to the National Horseplayers Championship (NHC) by winning a free, online qualifier against thousands of opponents at Horseplayers.com. Then, during Preakness week, he won an $18 feeder contest at Horsetourneys.com that earned him the right to play in a $165 NHC qualifier. He won that too, and the tournament neophyte suddenly found himself with not one but two entries, the maximum permitted, to the 2019 NHC. That brings us to the June 16 Spring Meet Horseplayers Tournament at Woodbine. Contestants, who paid $150 per entry, battled for $2,500 in bonus cash plus two NHC seats. So why did Wilkes purchase a maximum three entries for the Spring Meet Tournament given the fact that he was ineligible to win a third NHC seat? A friend and fellow contest player, Stephen McNatton, informed Wilkes that the NHC Tour offered generous bonus money of up to $100,000 (U.S.) to those who displayed sustained excellence throughout the year, as measured by a special points system. Wilkes’s two online victories had propelled him to the Top 20 of the NHC Tour standings, and McNatton told Wilkes he could move higher yet if he recorded a high finish at a live, brick-and-mortar event. With a reasonable entry fee of $150, the Spring Meet tourney seemed like just the ticket for Wilkes. It didn’t seem like such a hot ticket halfway through the competition. Players were required to make at least five $10 wagers from a starting bankroll of $50. With just three races remaining on the Woodbine card, Wilkes had lost three plays on one entry and two on the other two. He had yet to cash a ticket of any sort. Mr. Havercamp came through and paid $5.10 to win. Wilkes now had some ammunition with which to play the final two races. In the 9th race, he bet modestly, picking a different horse across each of his three entries. One of those was 7-2 winner Florida Won from the Norman McKnight stable. With one race to go, Wilkes now found himself in 3rd,13th and 25th places in the field of 137. Wilkes played his top entry very conservatively, wagering just the minimum $10, hoping to preserve a top 10% score that would earn him those NHC Tour points he was after. His 13th-place entry had about $86 on it, and he wagered it all on his top pick in the 10th, Love Thy Kitten, who was conditioned by one of his favorite trainers, Mike Maker. For his other entry, Wilkes played an all-in win bet on a different horse, a big longshot. Love Thy Kitten broke slowly, but rumbled home late to win and pay $10.80. The win moved Wilkes’s 13th-place entry all the way to first with a total of $464.90. The entry that had been third dropped back two places, but that still left him in first and fifth places. Wilkes got to keep his final bankroll amounts ($464.90 plus $145.25 for his 5th-place entry). He also received $1,125 from the Woodbine prize pool for the first-place finish and another $125 for finishing fifth—and he received enough NHC Tour points for the win to move all the way up to third-place in those standings. What’s next for Wilkes? The cost-conscious retiree—who advises new and prospective contest players to “Stay within your means”—will continue to concentrate on tournaments with reasonable entry fees and prize structures that offer solid value. Given Wilkes’s recent run, don’t bet against that happening. TORONTO, May 25, 2018 – Monday through Friday, Roger Cettina has little time to devote to horse racing. 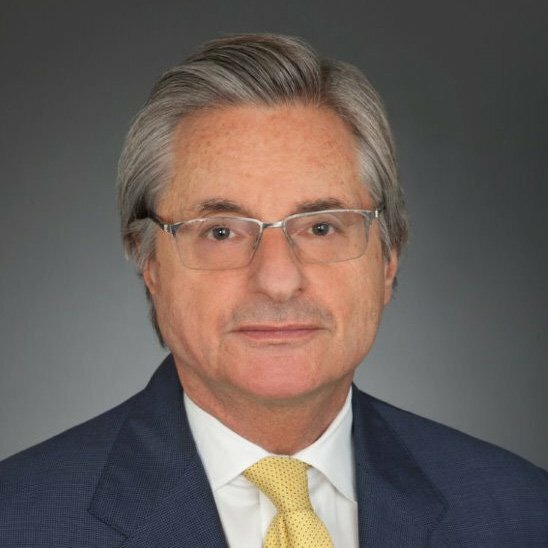 A 51-year-old vice president for the prominent, New York-based Tishman Construction Co., Cettina leaves his Rumson, New Jersey home each morning, makes the hour-long commute into the Big Apple, and spends his long day supervising his company’s many high-rise building projects in Manhattan and the surrounding area. “By the time I get home at night, at about eight-o’clock, I’m pretty spent,” Cettina admitted. It’s a different story on weekends. He often rises at 4:30 a.m., plunging into replays, trainer stats, Thoro-Graph speed figures, and Racing Flow bias and pace data. If he doesn’t see anything he likes, he has the discipline to just take the day off—or focus purely on his small stable of horses, which race under the appropriate name of Skyscraper Racing Group. If he sees some races that he likes, however, Cettina will gamble and play contests with gusto. Cettina has been well rewarded for all that early morning study time. Earlier this year, he cashed for $61,000 on a Gulfstream Pick Six. Cettina was alive on his $240 ticket to five horses in the last leg of that Pick Six. Three of them would have paid the entire Rainbow carryover pool of $148,000, but Cettina was anything but disappointed. “Parimutuelly, I’m good for the year thanks to this,” he said. From a tournament standpoint, Cettina is pretty much good for life after a couple of momentous efforts at the National Horseplayers Championship (NHC). Cettina has qualified for the NHC nine times, but he is most remembered for his performances in 2013 and 2016 when he finished second each time in fields of 455 and 629, respectively. Despite earning $200,000 for his runner-up placing in 2013, Cettina could be forgiven if he felt disappointed afterward. First prize was worth $750,000, and Cettina led by $240 heading into the final race. The 2016 near-miss, in which Cettina defeated all but $800,000 winner Paul Matties Jr., had an altogether different feel. Cettina left the 2016 competition in Las Vegas with $275,000—and the experience drove home a lesson that has served him well before, during and after the two close calls. This is one of Cettina’s favourite times of the year with Monmouth Park—just four miles from his house—open. Sometimes he rides there on his bicycle. Biking, hiking and hanging out at the beach with his wife of 18 years, Wendy, and his 15-year-old son, Marco, are just a few of the ways that Cettina maintains balance across what can sometimes be a stressful life. He also enjoys taking an occasional road trip to a tournament with his horseplaying friend Frank Sorensen. It is with Sorensen that Cettina first discovered tournament play some 17 years ago at Delaware Park. This year, the pair hope to get back to Woodbine where they have played multiple times, including in the 2013 Summer Tournament where Sorensen finished first and Cettina was second, earning himself one of his nine career NHC berths. “They have a great setup at Woodbine. It’s really nice there for contest players,” said Cettina. “First,” he said, “I play a lot at HorseTourneys.com, and I think it’s a great place to learn the online world. You don’t have to spend a lot of money to do so, though I do recommend that new players play live tournaments instead of Pick & Prays where you make all your picks in advance. Live games are more like real life. With Pick & Prays, you’re just watching, you’re not ‘finishing’ your handicapping. I’m a guy who likes looking at horses in the paddock and watching post parades and warm ups, and live games let you do all that. It’s even more fun once you can develop the discipline, skill and success of a Roger Cettina. TORONTO, April 27, 2018 – Ontario has always laid claim to a group of contest players that can hold their own with any in the world. Any doubts on this matter were certainly put to rest in recent years with the National Handicapping Championship wins by Barrie’s Brian Troop (2010) and Thornhill’s Ray Arsenault (2017) plus the Breeders’ Cup Betting Challenge (BCBC) victories posted by London’s Peter Behr (2013) and Toronto’s Tommy Massis (2015). What has occurred in 2018, however, has been nothing short of remarkable. Following the triumphs of Whitby’s Chris Littlemore in February’s NHC and Ottawa’s Bob Montgomery in March’s Horseplayer World Series, John Kimove of Wasaga Beach made it a veritable hat trick for Ontario with his conquest of 194 foes in yet another major 2018 North American handicapping tournament, the April 15 Keeneland Grade 1 Gamble. Why the recent run of Canadian success at the big events? Kimove has a theory. It was Keeneland, in Lexington, Kentucky, where Kimove found his biggest stage—and his biggest success. “It was just one of those days where everything went my way,” he said. Indeed, for his single afternoon of playing Keeneland runners over what was a wet, rain-drenched racing strip, Kimove earned $57,963 (U.S.) plus seats to the 2018 BCBC and the 2019 NHC. Having ventured to Kentucky specifically to play in the Grade 1 Gamble, skipping over Keeneland was hardly an option for Kimove. The tournament required that player start with a bankroll of $2,000, then make five plays of at least $400 each—all on the Sunday Keeneland card—and wager at least half their remaining bankroll on one of Keeneland’s last two races. Kimove got off on the right foot with a $400 win wager in the first race on a horse that seemed aptly named for the weather—Terrible Day. The $8.60 win mutual quickly boosted his bankroll to $3,400. Some uneven results over his next three plays, however, left Kimove with about $2,500 heading into the next-to-last race, race eight. For a moment in midstretch, it looked like Kimove might crush the race. His 1 horse, Vici, had been sent off at 14-1 and opened up a one-length lead with just an eighth of a mile to go. He could see a horse closing fast, though. Suddenly nervous, he strained to identify the late charger through the dreary conditions. It was the 6 horse—one of the three he had played in exactas with the 1—and he, too, was 14-1. Heartwood went on to win by a length and a half, but Vici held second. Between the $100 place bet on Vici and a $20 exacta with Heartwood over Vici, Kimove’s total was now up to $4,700. Still, there was work to do. Kimove was in 11th place with just that one race to go, and the leader was right around the $10,000 mark. Fortunately, one of his most preferred plays of the day was in the last race, #4 Ironclad, and he reminded himself of a lesson he had learned over the years while playing live-money contests. Kimove decided he’d bet $2,700 and put the other $2,000 aside so he could return home with a nice sum even if he lost. Now the battle was to figure out how to make that $2,700 with Ironclad count the most. He arrived at a play consisting of $900 to win and $400 to place on Ironclad, a $350 exactor on 4-8, $250 on 8-4, a $50 exactor box on 4-6-8, $20 exacta wheels keying the 4 with all, and $5 triactors keying 4 and 8 in the first and second slots with all; and also in the first and third slots with all. Sent off at 5-1, Ironclad “chased the pace early, swung into the six-path in the far turn, drove past the leaders in the stretch and drew away in the final stages,” according to the Equibase chart. Holding the others safe for second was #8 Shareholder Value. Between the $12.40 win mutual, a $6.00 place price, the $2 exactor payoff of $43.20, and the $1 triactor return of $226.40, Kimove turned his $2,700 race investment into nearly $17,000. His final total: $19,963. Kimove was a going-away winner! In addition to his cash winnings, Kimove is now assured of his first BCBC appearance and his sixth at the NHC. Four of those previous NHC berths were earned in tournaments at Woodbine. When handicapping in a tournament—or just playing the races during an afternoon at the track—Kimove primarily looks for one thing. One thing Kimove hopes never changes is his close relationship with fellow contest players like Ray Arsenault, Stephen McNatton, Gerry McLenin and Lawrence Katz. While the Keeneland victory was sweet, such triumphs are not what he treasures most about tournament play. TORONTO, March 30, 2018 – Self-employed accountant Bob Montgomery of Ottawa has loved watching and wagering on racing for almost as long as he can remember. The son of veteran Standardbred owner and trainer Robert Montgomery, young Bob was always hanging around his father’s farm and even began jogging horses not long after his fourth birthday. He soon developed a keen eye for the intricacies of harness racing and, from a wagering standpoint, found that many principles—especially trip handicapping—applied very neatly to Thoroughbred racing. By his adulthood, Montgomery was playing the Thoroughbreds even more enthusiastically than he was the Standardbreds. All that came to an abrupt and sad halt in 2000, however, when the passing of his wife Micheline left him as a single dad of two boys—Brendan, 7, and Liam, 3. In 2006, Bob saw a newspaper ad for the Horseplayer World Series (HPWS) at The Orleans Hotel and Casino in Las Vegas. Up until then, he was largely unaware of tournament play, but he decided to give the HPWS a whirl. He didn’t fare well but, in the process, he fell in love with the HPWS in particular—and contest play in general. In 2012, Montgomery had more than just fun at the World Series. He finished second in the three-day competition, earning $68,000 (U.S.). It was by far his biggest payday playing the horses. Buoyed by his success, Bob played tournaments even more enthusiastically, with cousin Mike supporting him every step of the way and accompanying him on most of his road trips to tracks and casinos. Bob qualified for four National Horseplayers Championships (NHCs) and played in a pair of Breeders’ Cup Betting Challenges (BCBCs) in the years that followed. Though he never tasted success approaching that of his 2012 score at The Orleans, it hardly seemed to matter given how much fun Bob and Mike had along the way. As per usual, the inseparable pair planned to head to Las Vegas yet again for the 2018 HPWS on March 8-10—until tragedy struck Bob for a second time in his life. Bob and his entire family still had very heavy hearts by the time March rolled along. He had already won a $1,500 entry to the upcoming Horseplayer World Series via the online qualifying site HorseTourneys prior to Mike’s death, and so despite the obvious reservations, Bob pressed on and journeyed out to Las Vegas, comforted somewhat by the feeling that Mike would have absolutely wanted him to go to the tournament that had meant so much to them both. On Day 1 of the tournament, the trip may not have seemed like a great idea. Never a fan of playing claiming races, Bob likes to zero in on maiden, allowance and stakes races to come up with his requisite number of 15 daily $20 win and place plays in the mythical-money contest. But on a Thursday, allowance races seemed in short supply and stakes were non-existent. In short, pickings were slim. Bob finished Day 1 well back in the field of 428 with 600 points—essentially a break-even day. He had an almost identical Day 2, giving him a two-day total of 1,250 points that left him in 64th place—and he was only that high up the leaderboard because favourites had been ruling supreme the first two days, serving to depress the scores at the top. Still, Bob was 700 points behind the leader. Heading into Day 3, Montgomery didn’t lose faith. “I always had the feeling that Mike was up there helping me,” he said. With seven contest tracks in play on the final day, Bob again looked solely at what he considered to be the most formful races: maidens, allowance and stakes. From there, he wanted horses who may have had difficult trips in their last starts, regardless of how their speed figures looked. And since it was a Saturday, there were finally some stakes to choose from. Bob started quickly and inched his way up the standings. When it was time for the day’s Tampa Bay Derby, he knew his moment was at hand. “Quip was one of my best bets of the day,” he said. The longshot went off at 19-1 and when he ran down the early pacesetter to grab the victory, the win/place payoff of $40.20/$13.80 gave Montgomery 538 points, moving him all the way up to second place. Within an hour, after a strong performance in the late races at Santa Anita, Montgomery found himself with a lead he would never relinquish. He won $231,120 (U.S.) for his three-day victory plus another $3,852 for having the second-highest score of anyone on Day 3. The win—and windfall—also meant good things for those closest to Bob, including sons Brendan and Liam, now 26 and 21, respectively. Bob is using a large chunk of his winnings to help Brendan buy a house, and to pay off all of Liam’s student loan debt as he finishes his senior year at Carleton University. Bob also plans to go in on a modestly priced Standardbred with his father, who ignited his love of racing. Bob’s win carried national significance as well given that he is just the latest to add his name to the roster of Canadians who have won major North American handicapping championships (including two BCBCs and three NHCs) over the past eight years. Now he looks forward to this year’s handicapping tournaments at Woodbine—he plans to play in all four—and he hopes plenty of newcomers join him there. “I have two pieces of advice for those new to contest play,” said Bob. “First, talk to as many people as you can. Ninety-five per cent are extremely open and helpful. Second, try to develop a methodology that works for you and stick to it. Woodbine Entertainment and Monmouth Park have partnered on an unprecedented $5 million bonus that will be a highlight of the North American handicapping contest schedule in 2018. The bonus will be awarded to a player who finishes in the Top 10 of the $400 Monmouth/Woodbine handicapping contest on June 30 at Monmouth Park, then wins the $250 Monmouth/Woodbine handicapping contest on October 13 at Monmouth, then goes on to win the 2019 National Horseplayers Championship at Treasure Island in Las Vegas. TORONTO, February 23, 2018 – When last we checked in with Chris Littlemore, the 58-year-old retired auto worker from Whitby, Ontario had just won a Breeders’ Cup Betting Challenge entry at Woodbine and was looking forward to his November trip to Del Mar for the competition. That tournament didn’t go too well for Littlemore. He finished in 138th place. So much can change in three months. 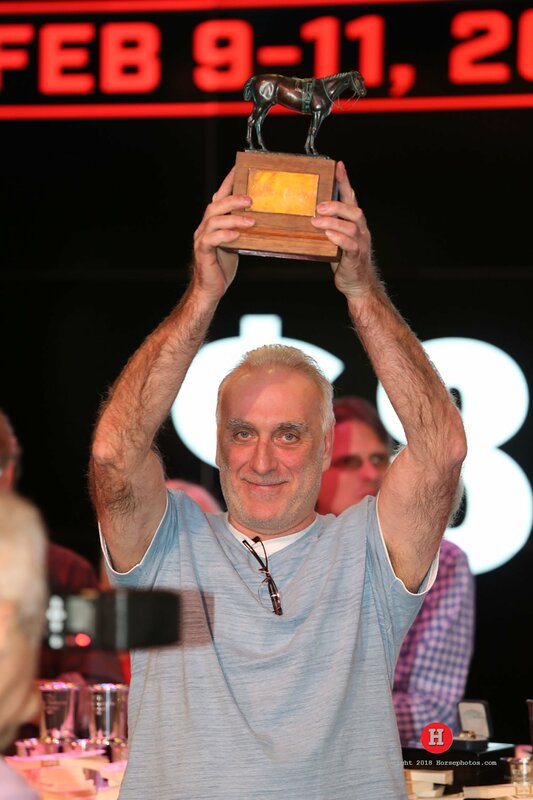 After becoming one of the last to qualify for the National Horseplayers Championship via a Top 150 finish in the 2017 NHC Tour, Littlemore made the very most of his opportunity by finishing first of 697 entries in the three-day event at Treasure Island and capturing the gaudy $800,000 (U.S.) first prize. Littlemore accomplished something pretty good not just for his own bank account, but even for Canadian pride. He is the third winner to call Canada home in the NHC’s 19-year history and the second in as many years—following Thornhill, Ontario resident Ray Arsenault’s $800,000 victory in 2017. 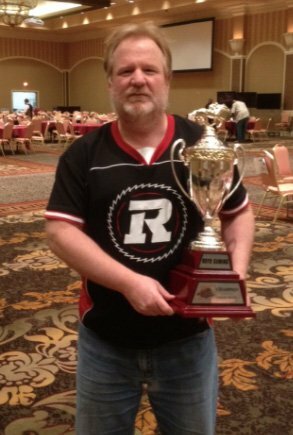 Toss in the NHC win in 2010 by Barrie, Ontario’s Brian Troop, and it seems that Canada in general—and Ontario in particular—has become the hotbed of NHC Champions. Ray Arsenault feels much the same way. Littlemore’s NHC got off to what he called a “decent” start on Friday’s first day of competition. By Littlemore’s standards of understatement, however, that meant finishing the day in 11th place—within the top 2 per cent of the field. He had hoped to amass $100 in contest earnings that first day, and he ended with $124.60. Despite the auspicious beginning, Littlemore still wasn’t confident entering Day 2 due to what he considered an overabundance of terrific players in the field. However, he was determined not to make the same mistake he made in the previous year’s NHC. The self-reminder paid its first big dividend in optional race eight at Gulfstream, in which Littlemore pulled the trigger on the Mark Casse-trained Biloxi Bay. The win/place payoff of $32.20 and $14 shot Littlemore from 11th to second place. Littlemore then focused on the last race at Aqueduct, but when the horse he liked was going off at unacceptably low odds, he decided to pass on the Big A and take a look at the seventh at Oaklawn. The race, to be run over a sloppy track, looked like a wide-open affair to Littlemore. That horse was Holiday’s Angel. As post time neared, her odds were drifting and drifting, so Littlemore made the play. When Holiday’s Angel reported home first by a length, Littlemore suddenly added $51 ($39 to win and $12 to place) to his score. He was now in first place. “I still had a couple of bullets left too,” Littlemore recalled. After a couple of hours had passed, Littlemore was still in first place, but not by much. Then he connected with Dano’s Dream ($27.60, $11) in the eighth at Golden Gate. “That’s the one that really vaulted me ahead,” Littlemore said. Littlemore finished the day with $311.70—$51 more than Keith Fenton in second place. Buoyed by the three longshot scores, his total score on Day 2 alone was $187.10. Only one player amassed a higher Day 2 score. By Saturday night, Littlemore was exhausted though—perhaps not surprisingly—he had trouble getting to sleep. Did that winning $20 bet give Littlemore a good feeling somehow about how the next day might turn out? As it turned out, Littlemore still needed a measure of good luck on Sunday—because his premonition about not having a feel for Sunday’s races proved all too accurate. He made just two place collections during the day’s 10 optional plays. That added an underwhelming $20 to his score, but he still maintained a $40 lead as the top 10 proceeded on to the final table. No one was making any significant move at Littlemore. Littlemore was referring to the final table of 10 competitors who squared off over the course of seven mandatory races that would bring the contest to its conclusion. And Littlemore’s luck related to how those final seven races played out. Taking advantage of his opponents’ lack of momentum, Littlemore finished the three-day marathon with a final score of $348.30—$33.10 more than Keith Fenton, who prevailed in a tight battle to hold second position. Fenton’s second-place prize money was a bountiful $250,000. But during and after the third and final day, the majority of eyes were focused squarely on Littlemore. Perhaps Littlemore will leave the jumping up and down to his wife Eliane. Or his daughter Sophie—currently in her third year at Wilfrid Laurier University—and son Luke, who will either be heading off to university next year or playing Junior hockey. Both Sophie’s and Luke’s educations are suddenly taken care of. As is Chris and Eliane’s mortgage. One of the things he will do in 2018 is continue to play contests. His berth to the 2019 NHC Finals is now secured via the automatic bid that all defending champions receive. (His Eclipse Award as North America’s Horseplayer of the Year is also in the bag.) He doesn’t plan to try overly hard for a second NHC seat because he questions his ability to manage two entries successfully, but he does have something of a wish list for 2018. One can imagine Littlemore perhaps taking a figurative victory lap around the ice on Monday, the day after his NHC victory, holding his newly-won Eclipse Award aloft. By Tuesday, there was no more resting on laurels. Chris was back home in front of his computer screen in Whitby that day, playing a $27 HorseTourneys feeder on the Parx races, trying to win a spot in a qualifier for Keeneland’s big Grade One Gambele tournament in April. “I’ll still try to do it the way I’ve always done it,” he said. And so will “Team Canada” in next year’s NHC. TORONTO, December 9, 2017 — Earlier this year, Paul Shurman of Dix Hills, N.Y., was inducted into the National Horseplayers Championship Hall of Fame—and with good reason. The 63-year-old worker’s compensation attorney has qualified for the prestigious Las Vegas event each of the last 15 years—a record he shares with just two others. And this coming February will mark NHC appearance #16. But Shurman does more than just show up to the NHC. He has finished in the top 6 of the 500+ entry tournament a remarkable three times, including a third-place finish in 2009 worth $100,000 (U.S.). His 6th-place finish in 2012, however, may have been even more exciting. Having finished the year as the 2011 NHC Tour Champion, Shurman pocketed $75,000 and also went into the 2012 NHC eligible for a $2 million bonus should he win that year’s big event. With one race to go, he was in fourth-place, and within striking distance of the leader. Missteps have been rare for Shurman, who has won, by his count, approximately 50 tournaments over the years and amassed contest earnings of some $700,000. This year, he won Monmouth Park’s Pick Your Prize tournament in June, guaranteeing a 16th straight visit to the NHC and a sixth consecutive appearance at the Breeders’ Cup Betting Challenge. And in September, he did something he had never done before. He played in a tournament at Woodbine. 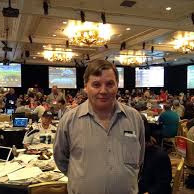 Shurman’s accomplishments, however, only explain in part why he was inducted into the NHC Hall of Fame, and why he is among the most respected contest players in North America. 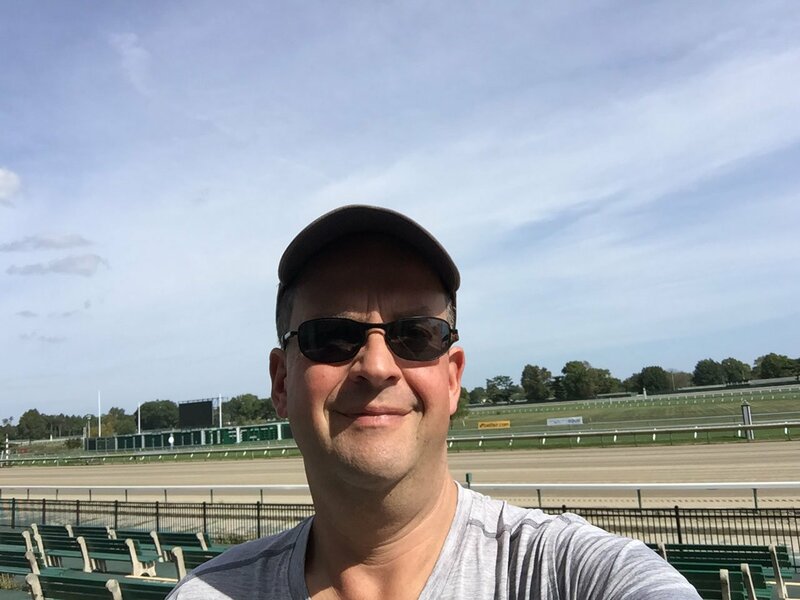 A longtime member of the NHC Players’ Committee, Shurman has been untiring in his efforts to work with the National Thoroughbred Racing Association (NTRA) and racetracks throughout the continent to improve contest experiences for all and to boost the profiles of his fellow tournament players. In 2001, though, Shurman was largely unaware that contests even existed. Bari, his wife now of 27 years, encouraged him to go, and that day ultimately changed Paul’s life. In addition to being generous with his time to support and improve contest play, Paul is always happy to share with his fellow players the methods and strategies that have led him to his many tournament successes. In a world in which players often seem like they are picking horses simply in order to achieve a desired score, Shurman prides himself on the so-simple-it’s-brilliant strategy of “playing horses that I like.” But the Shurman handicapping process does have multiple dimensions. It’s this process that he thinks explains why the NHC has been such fertile ground for him. What constitutes his criteria? One of his favourite angles is horses going from age two to age three—or age three to age four. In contest play, Shurman believes that one key is to have an approach whereby you are looking for reasons to play, as opposed to toss, a horse. While most of Shurman’s theories have relevance across all modes of Thoroughbred handicapping, he also has some strong beliefs specific to contest play. Shurman is also a big believer in preparation—even though his approach may strike some as unconventional…or at least non-chronological. Knowing what he likes—and what to ignore—has taken Paul Shurman to rarefied air in the tournament world. He and Bari have a 21-year-old son Jared, who is currently a senior at Tulane. Jared loves Saratoga and will occasionally play some races, but he has shown little interest thus far when his father tries to get him interested in contest play. “It’s your thing, Dad,” he’ll say. TORONTO, October 20, 2017 – When Whitby, Ontario native Chris Littlemore decided to enter the September 16 Woodbine Mile Handicapping Tournament, his goals were modest—even as he found himself leading the event with just a few races to go. At the Woodbine Mile event, Littlemore got caught late by winner Ali T. Aksoy, but stayed ahead of everyone else and earned over $8,500 in cash plus a coveted, fully-paid entry (worth $10,000 U.S.) in the November 3-4 Breeders’ Cup Betting Challenge (BCBC) at Del Mar. For Littlemore, this November will mark his second BCBC appearance, having played for the first time last year when he got off to a good start, then had a difficult Day 2 that saw him drop back to the middle of the pack. And he’s also been a successful guy—even against deep, international fields of contest players. His 2016 BCBC entry was won by virtue of winning the 2016 NHC Consolation tournament when Littlemore bested more than 400 players on the event’s third and final day. It was a performance made even more impressive given that, a mere five years earlier, Littlemore wasn’t even aware that contest play existed. And the self-described “small-time player” continues to do well in them. He’s qualified for the last four NHCs and at the NHC’s most recent renewal last January, he finished 29th in the field of more than 550, earning $6,500 (U.S.). But he still picks his spots carefully. Littlemore is nothing if not modest. But there are also some little indicators out there that suggest a major tournament like the Breeders’ Cup Betting Challenge could be well within his wheelhouse. Early speed often wins more than its share of races in Southern California, and Littlemore is an unabashed fan of horses that race on or near the lead. “Something has to be really eye-catching for me to like a deep closer,” he said. But there are also some broader reasons to think that Chris may have a “little more” luck at a venue like the Breeders’ Cup. Littlemore also comes from a place—Canada—that has produced a pair of NHC winners in Brian Troop and Ray Arsenault, and two Breeders’ Cup Betting Challenge champions in Tommy Massis and Peter Behr. More and more, top handicappers throughout North America are finding their way into contests, just as Littlemore did some six years ago. For those contemplating an initial foray into contests, he has a simple piece of advice. You may not hear a lot of raucous cheering from Chris Littlemore when one of his horses crosses the finish line first at Woodbine—or Del Mar. You certainly won’t hear any self-aggrandizement. But he, too, has become a player to watch among the many skilled tournament contestants throughout North America. TORONTO, September 20 – In 2016, Ali T. Aksoy twice thought he would win contests at Woodbine. Both times he opened up sizable leads only to be caught late en route to second- and fourth-place finishes. It was Ali’s wife Aisha who helped get Ali back on a positive path. She encouraged him not only to put the painful defeats behind him, but to learn from them. After that September 16 competition, there was only cause for celebration. Players started the $3,500-buy-in contest with a $2,000 live bankroll. They were mandated to play $400 each on their choice of five Woodbine races, plus they were required to bet at least have of their existing bankroll on one of the two final races (either the Race 12 Woodbine Mile or Race 13). Largely on the strength of a pair of wining daily double bets, Aksoy worked his bankroll up to $4,500—good for second place—heading into the Woodbine Mile. And in the big race, he liked multiple stakes winner World Approval. When World Approval won and paid $6.70 to win and $3.00 to show, Aksoy found himself leading the field with $5,702.50–$404 more than his nearest competitor Chris Littlemore of Whitby, Ontario. “It turns out that this time I too did well having a horse to run at—just like World Approval!” Aksoy said of chasing down Littlemore. But what should he do now? The year before, in this very same tournament, Aksoy stood pat at the end and wound up dropping from first to fourth place. He didn’t want to get passed for a second straight year so he made a $300 place bet on what he thought was the race’s most likely winner, Prized Bourbon. When Prized Bourbon won and paid $4.60 to place as a 3-1 win proposition, Aksoy was alone at the top with $6,092.50. And it’s a good thing he didn’t sit out that 13th race. Littlemore used it to up his total to $5,861.50. Had Aksoy skipped the race, it would have meant another bridesmaid finish. Instead, Aksoy won his final bankroll plus an additional $15,322 in prize-pool money along with a coveted $10,000 seat plus travel expenses to November’s Breeders’ Cup Betting Challenge (BCBC) at Del Mar. And if he manages to win that event, Aksoy will win a special $500,000 Woodbine bonus for capturing both the Woodbine Mile tournament and the BCBC. 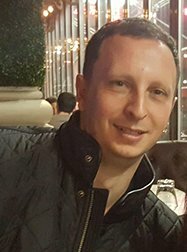 On the heels of his richest tournament score ever (approximately $35,000 in cash and prizes), Aksoy is optimistic that another winning performance at a prestigious “major” competition like the BCBC or NHC is not beyond his grasp. Contest play has clearly proven to be fertile ground for Aksoy and his handicapping acumen. Regardless of what happens at the BCBC, Canada—and Woodbine—can already lay claim to yet another of North America’s very best horseplayers. TORONTO, September 27 – Michael Eisen always loved horse racing. But until he retired in 2013 after a long and distinguished career as Microsoft Canada’s Chief Legal Officer, the Toronto native never really had the time or inclination to participate in handicapping tournaments. That all changed in a big way this year. After dipping a first toe into contest waters last year, Eisen stepped up his play significantly in 2017, participating in each of Woodbine’s four handicapping tournaments during the year. He didn’t finish first in any. But two third-place finishes (in the Woodbine Spring Meet Tournament on June 24 and the Woodbine Weekend Handicapping on August 26-27), a sixth-place performance in the September 16 Woodbine Mile Handicapping Tournament, plus an off-the-board effort in the July 29 Woodbine Mid-Summer Handicapping Tournament combined to put Eisen at the top of the standings in the first-ever Woodbine Player of the Year Series, which is based on a points formula recognizing both strength-of-performance and participation. For the Series victory, Eisen receives $6,500, plus a paid entry to the 2018 Woodbine Mile Handicapping Tournament (a $3,500 value in 2017) and—very notably for Eisen—a Sovereign Award. If there was one common theme for Eisen during the four tournaments, it was his penchant for strong finishes—especially in the Woodbine Weekend Tournament when he managed a third-place finish despite finishing the first-day of the two-day competition with zero. What Eisen also finds rewarding is just the simple experience of a day at the races—especially when joined in the clubhouse or at home in front of the television by his 34-year-old son Ben. “He loves racing as much as I do,” said Eisen. “We love going and watching the big races together. And Eisen believes the fun factor is an important aspect of live tournaments as well. “I don’t go into these things all super serious, competing to the death,” he chuckled. “I thing you should enter because you love the sport. If you get knocked out early, you can still enjoy the time you spend there with the other players. “It sounds like I’m blowing smoke, but I’ve always considered myself really lucky to have a track as beautiful as Woodbine so close to home. It’s a very clean track and the tournaments are really well run. The staff is very friendly and accommodating and the trackside tent where the contests are held is terrific. The setting at Woodbine is truly excellent. Eisen admits, though, that within the offices of Microsoft, fellow racing fans were hard to find. “I was an anomaly,” he said, drily. Today, there is no such paucity of like-minded hobbyists in Eisen’s post-corporate life. And you could say that tournament play has opened up even more “Windows” in that area. That will be even truer next February when he ventures to Las Vegas to compete in the National Horseplayers Championship for the first time. 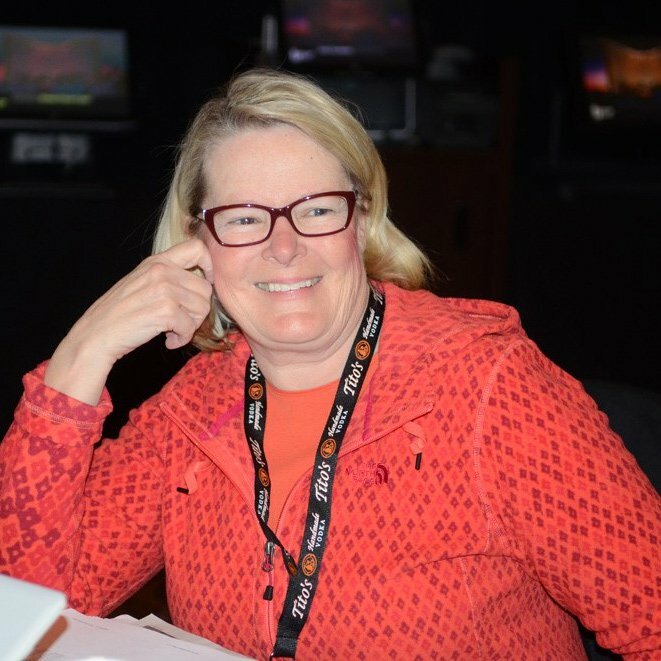 TORONTO, August 30 – When Carol Johnson of Oakton, Virginia, won the June 24 Woodbine Spring Meet Handicapping Tournament, she became an immediate frontrunner in the Woodbine Player of the Year series. So it only made sense that she and her husband Brent—an avid contest player who is already double-qualified for the National Horseplayers Championship (NHC)—would make a return trip to Woodbine for the August 26-27 Woodbine Weekend Handicapping Tournament. The couple were planning to travel that weekend anyway. The couple had the thrill of a lifetime when their modestly-sized Bushwood Stable campaigned the venerable turf distance specialist Better Talk Now during the early 2000s. The gelding, who won the 2004 Breeders’ Cup Turf en route to career earnings of $4.3 million and who raced successfully until 2009 when he was 10, had a stakes race at Saratoga named for him on August 28, and Brent and Carol would be presenting the winner’s trophy. So they planned a drive from Virginia to Woodbine, then over to Saratoga Springs before heading back home. The Woodbine leg of the trip was supposed to be mainly about Carol, of course. She purchased the maximum three entries to the $600 ($300 for live bankroll, $300 to the prize pool) buy-in competition. Brent just bought himself one. With four of the five tournament seats in the prize pool dedicated to the NHC—for which Brent had already qualified the maximum two times—the 54-year-old retired investment advisor figured the main allure for him was the one available $10,000 (U.S.) Breeders’ Cup Betting Challenge entry that would likely be selected by the winner. Carol, unfortunately, never got any real traction with her plays over the course of the Woodbine weekend, and she finished off the board with all three of her entries. And things started off pretty grimly for Brent as well. He finished Day 1 of the two-day tournament with a grand total of 75 cents. The poor Day 1 showing, however, was neither demoralizing nor completely unexpected for Brent. Johnson, indeed, succeeded all too well in going broke on Day 1. So now it was on to Plan B—an uber-aggressive approach on Day 2 that would either put him into contention for the win…or end his day early. What he needed were some solid horses to parlay. Johnson made a couple of requisite $15 plays that lost, then went all-in with $120 to win on First Appeal in the 7th at Saratoga. First Appeal won and paid $4.60, which gave Brent $276. He made three more compulsory $15 bets that lost. Then took his remaining $241 and put it all to win on Ginger N Rye in the 9th at the Spa. When Ginger N Rye won and paid $8.80, Brent was up to $1,016. The leader had $2,100, though, so Johnson needed to strike one more time. He scanned the remaining races available to him from Woodbine, Saratoga and Gulfstream and decided that he would rest his hopes on Gray Phantom in the 10th at Woodbine. Gray Phantom won and paid $4.30, leading Brent to his victorious final total of $2,250.05 that no one else managed to top. The road was bumpy, but Brent’s combination of handicapping skill and strategic acumen had earned him that final bankroll total, a $600 bonus for having the top Day 2 score, and the coveted Breeders’ Cup Betting Challenge entry. And now both he and Carol figure to be formidable forces in the quest for the Woodbine Player of the Year bonus which offers $6,500 and a seat to the 2018 Woodbine Mile Handicapping Tournament to the best overall performer. The accomplished tournament player Allan Schaffer of Toronto finished second with $1,985. He and 3rd, 4th and 5th place finishers Michael Eisen ($1,415.75), Daniel Horvat ($1,257.90) and Howard Rubin ($1,257.50) each won NHC berths along with their cash. Rubin also won an additional $600 for having the highest Day 1 score ($934.75). Look for these players to all be back for a return tangle with the Johnsons on September 16 in the Woodbine Mile Handicapping Tournament​ ($3,500 buy-in), which is expected to offer $165,000 in cash and prizes. And expect some good-natured banter between Brent and Carol (a CPA) leading up to the 16th. ​TORONTO, August 24 – As a longtime criminal lawyer, Peter Behr of London, Ontario, has crossed paths with plenty of people who have tried to beat the system. That even happened the first time he ever played in a handicapping tournament. “It was back in 1989 at a harness contest in Ohio at Northfield,” said Behr, 66. “The contest was worth about $100,000, and I believe it was winner take all. You could make only mythical win, place or show bets. It was an unusual—and certainly memorable—introduction to handicapping tournaments, but despite the odd circumstances involved, Behr found himself captivated. He went on to play in a series of Las Vegas tournaments during the 1990s, and he has qualified for seven of the past eight NHCs. By far, the most dramatic moment of his contest career, however, came at the 2013 Breeders’ Cup Betting Challenge (BCBC) at Santa Anita. Muddling along on Day 2 with close to his starting bankroll of $7,500, Behr found himself attracted to a horse in the Breeders’ Cup Juvenile Fillies that had previously run in Canada before being sold, was adding blinkers, had good workouts and was a fat 32-1 in the betting. He pulled the trigger on $4,000 worth of bets on the filly, Ria Antonia but, alas, after a fierce stretch drive, the horse finished second. Not long after the horses crossed the wire, however, the inquiry sign was posted and the winner’s number began blinking on the toteboard. After a lengthy delay, the order of finish of the top two was reversed. Ria Antonia—and Behr!—were winners. In Behr’s case, his $4,000 in bets turned into $120,000. He was now in first place with $128,000. But a few races later, another player edged in front of him with $145,000 going into the day’s last race, the Breeders’ Cup Classic. “I figured I’d finish second, just like what usually happens on Jeopardy!, because we’ll either both be right or we’ll both be wrong in the Classic,” Behr said. He was half right. Behr and the leader were, indeed, both wrong with their plays in the Classic. But Behr had bet $4,000 (on losing European shipper Declaration of War), and his foe had risked $26,000, which wound up dropping him below Behr. Between his live betting bankroll and money from the prize pool, Behr had realized the score of a lifetime–$324,000. While Alex Trebek may have credited the BCBC victory to superior money management, Behr chalked it up to one thing. Behr isn’t totally against the occasional throwing of a dart, however. Being daring (as evidenced by his Ria Antonia bet) is a lesson he learned many years ago in contest play. In terms of present-day lessons for new or prospective contest players, Behr recommends playing online. The other thing he likes about online contest play? TORONTO, August 2 – Sometimes the most important decisions in handicapping contests are made well before the first race is run. When Ed Reidy, a physician from Pittsburgh, saw that players would be starting the July 29 Woodbine Mid-Summer Handicapping Tournament with a $250 betting bankroll, he figured from his experience with live-bankroll events that it would take about $2,500—or 10 times his starting stake—to have a good chance at winning the 67-player tourney. When he read that contest play would allow for Win, Place, Show, Exacta and Daily Double wagering, his strategy became even clearer. The competition required players to make 10 plays of at least $25 each on races from Woodbine and Saratoga with at least five having to be on Woodbine. Reidy decided he would supercharge his chances a bit by making five $50 exacta plays. If he was successful with any, he could then go about making his five other requisite plays. If not, well…at least he would go down swinging. His first cold exacta play came in the second race at Saratoga. “I missed by a quarter of an inch,” Reidy said. (In more traditional racetrack parlance, he had the winner but got beat a nose for second.) His next planned play was a cold $50 exacta on 6-5 in the third at Woodbine, going off at 1:59 p.m. It was the start of a great 35 minutes for Reidy. The 6 horse won by 1 ¾ lengths at odds of 7-1 and the 5 horse, the 6-5 favorite, complied by running second. The $2 exacta paid a generous $50.90—which Reidy had 25 times for a total collection of $1,272.50. With that first collection achieved, Reidy now tweaked his strategy slightly by switching to $25 exactas. This would give him more opportunities to up his total, while still contributing towards his mandated 10 plays of $25 or more. The strategy paid off. He immediately hit back-to-back $25 exacta plays, connecting first on a $66 (for $2) exacta in the 2:07 p.m. third race at Saratoga that combined a 1-2 winner with a 30-1 runner-up. At 2:34 p.m., he had an even bigger score, putting $25 on the 2-7 combination in the fourth at Woodbine that paid to the tune of $125.40 for a deuce. Reidy’s total collections for these two races: $2,392.50. That raised his overall bankroll total up over the $3,700 mark. At this point, Reidy told himself he wouldn’t look at the leaderboard until after the seventh race at Woodbine. He wanted to concentrate instead on just getting all of his requisite plays in. Reidy finished the day with an even $3,500, which he retained along with his winner’s share of the prize pool–$2,227.50, plus a coveted seat to the February 2018 National Horseplayers Championship ​(NHC) in Las Vegas. It will mark the seventh straight year that Reidy has qualified for the NHC. Pasquale Parente rallied valiantly to finish second with a bankroll of $1,661.28, which earned him an additional $1,089 from the prize pool plus the other available NHC berth. Mike McIntyre ($1,160.50), Stephen Nowicki ($817.85), Frank Brown ($523.50), Pasquale Filippelli ($495.40), Stephen Nowicki (entry #2–$437.05) and Daniel Dreger ($388.60) rounded out the top eight in the standings, and took home additional prize pool winnings ranging from $495 to $99. A previous commitment will preclude Reidy from attending the Woodbine Weekend Handicapping Tournament on August 26-27. That could be good news for those with designs on the Woodbine Player of the Year Series title, since Reidy also missed the June 24 Woodbine Spring Meet Handicapping Tournament won by Carol Johnson. Series rules requires participation in three of the four 2017 Woodbine tournaments to be eligible for Player of the Year honors and the cash and prizes that go with them. However, Reidy already has September 16—the date of the $3,500 Woodbine Mile Handicapping Tournament—circled on his calendar. 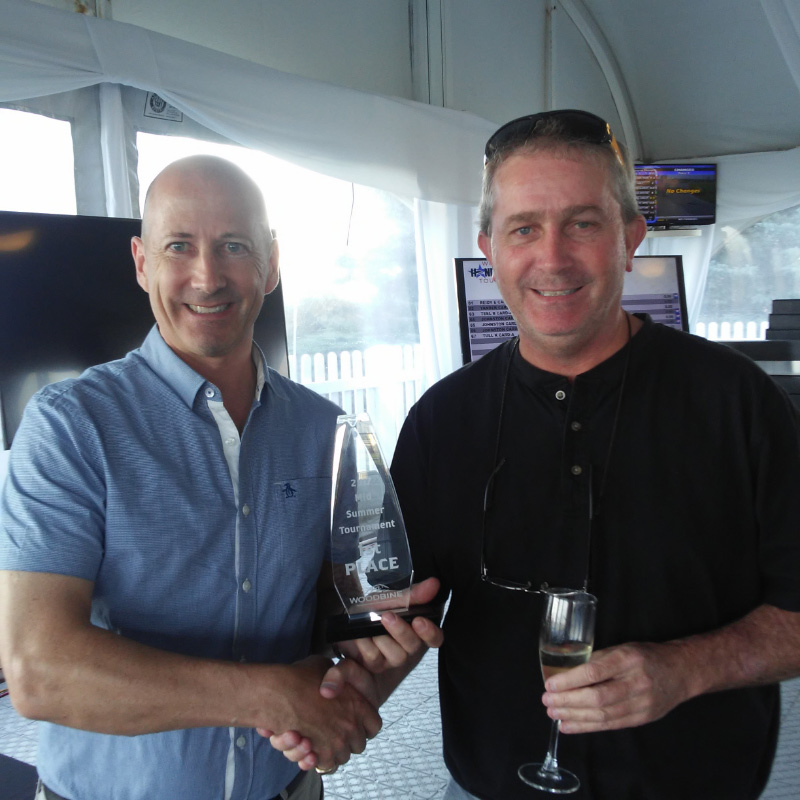 Thanks to an artful blend of handicapping skill and game strategy, Reidy got a lot closer to the horses during the Mid-Summer Handicapping Tournament than his competition got to him. TORONTO, July 27 – The highlight of Sheldon Usprech’s long handicapping career occurred just last January when the retired teacher and administrator from Toronto earned $25,000 at the NHC in Las Vegas from an 11th-place finish in the field of more than 600. For many of us, a performance like his would feel like something of a crowning achievement…an arrival. And yet the ongoing, almost daily search for such answers is what has made horse racing handicapping such a compelling pursuit for the academically driven educator, who spent 36 years teaching English, Philosophy and Drama before retiring five years ago. Usprech’s philosophical nature showed itself following the most recent NHC when he missed the 10-player “Final Table” by just $1.50. He looked to be in great position to advance to the final round when his final pick won at Tampa Bay Downs. But during the very last moments of wagering—after his selection had already been made—Usprech’s horse got knocked down from 3-1 to 5-2 and the slightly reduced win and place payoffs that resulted from the late money kept him out of the final 10 and effectively ended his tournament. With $75,000 in contest earnings and six NHCs—including the last three in a row—under his belt, Usprech attributes his parimutuel and tournament success to a data-driven approach that befits a person of his scholarly bent. Usprech has won, by his count, approximately 30 tournaments, including online competitions. He has only missed one local, onsite contest (“Woodbine does a great job with its tournaments.”) in the last 18 years, and he’s also a fan of those offered at Arlington, Monmouth and Hawthorne. Other than that, most of his play is online. He has yet to compete in a Breeders’ Cup Betting Challenge, but he feels less adept in live-bankroll situations. Not that he’s a bad gambler. He’s currently enjoying his best year since his retirement five years ago, with about 60% of his 2017 winnings coming from parimutuel play and 40% from his contest pursuits. Much of his betting bankroll is targeted on Woodbine and the NYRA circuit. But his favorite betting meeting of the year has just begun. When not smoking out longshots, Usprech enjoys going out to restaurants and attending movies and the theatre with his wife of 44 years, Ina. And becoming a grandfather a year and a half ago has put an additional spring in his step. Other family members don’t follow the races like Sheldon does. But he’d love to see newcomers join in the fun so that the sport—and contest play, in particular—can continue to grow. Ask Usprech what advice he would give a prospective contest player, and school is very much back in session for the career educator. His second key piece of advice? “Don’t be afraid. You can go on HorseTourneys.com or one of the other online sites and play a couple of contests for $12 each. It won’t take very long until you get a feel for what you need to do to win. You can’t play all chalk and expect to do well, but any other style will fit as long as you are open to adaptation as you go. Hit the books with Sheldon Usprech! TORONTO, July 10 – Woodbine Racetrack is a long way from Oakton, Virginia. 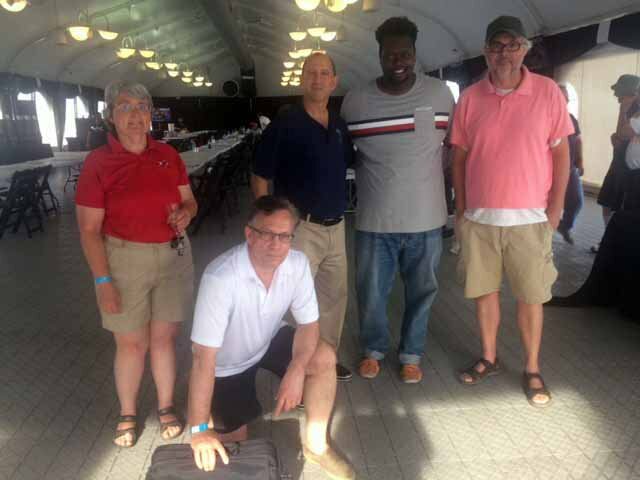 Long enough that Carol and Brent Johnson thought twice about travelling for the June 24 Woodbine Spring Meet Handicapping Tournament–Woodbine’s first of four major handicapping contests in 2017. But Brent—already double qualified for the National Horseplayers Championship (NHC)—thought the Woodbine competition could be a good spot to pick up additional NHC Tour points. And both he and Carol had a soft spot for Woodbine. As prominent partners in Bushwood Stables, Brent and Carol campaigned the venerable turf gelding Better Talk Now (who was euthanized unexpectedly just three days after the Woodbine Tournament on June 27 due to complications from colic surgery). Better Talk Now’s career spanned nine years during which he won the 2004 Breeders’ Cup Turf and amassed earnings of $4.3 million—some of which was came in a 2006 victory in the Sky Classic Stakes at Woodbine. The trip proved to be even more worthwhile than Carol and Brent had envisioned. Each took the maximum three $150 entries that included a live starting bankroll of $50 from which the 185 entrants had to make at least five $10 wagers on the live Woodbine card. Only one of Brent’s entries was still alive, with just $40, heading into the final contest race. But Carol, one of five women competing in the tournament, had two entries in contention with just the one race to go. Brent, meanwhile, settled on a 13-1 shot that ran a creditable—but for him, unrewarding—fourth. His longshot actually had the lead until the final sixteenth of a mile when he was passed by three foes—including both of Carol’s horses. “It was a long photo,” she said of the race 10 finish that saw the top three separated by just two heads. When the order of finish was posted, it was Carol’s #14, Nadeleine, prevailing at 9-1. (Ocean Court finished third.) And to Carol’s great relief, none of the 10 players ahead of her had “gone all in” and staked their entire bankrolls on Nadeleine. What started out as a spur-of-the-moment road trip for the Johnsons now found Carol the winner of $5,250 (Her final bankroll of $2,235 plus the first-place bonus money of $3,015 from the prize pool) and a berth in the February 8-10 National Horseplayers Championship in Las Vegas. The tournament’s other available NHC seat went to runner up John Kimove, who finished with $1,766.55 and earned additional bonus money of $1,474 on top of that. Rounding out the roster of money winner in the top seven were Michael Eisen ($1,090.90 bankroll plus $737 from the prize pool), Richard Park ($654.70 + $469), Stephen Sedef ($469.20 + $335), Frank Brown ($384 + $335) and Tim Griffiths ($374 + $335). The Woodbine Spring Meet Handicapping Tournament is the first leg of a newly-announced Woodbine Player of the Year Series that includes the meet’s three other big handicapping contest events: the July 29 Woodbine Mid-Summer Handicapping Tournament; the August 26-27 Woodbine Weekend Handicapping Tournament; and the grand finale, the September 16 Woodbine Mile Handicapping Tournament where $165,000 in cash and prizes are expected to be awarded. All contestants who participate in at least three of Woodbine’s four 2017 competitions are automatically entered with Series points for each competition awarded based on one’s finish as well as the size of the field. The Player of the Year will win $6,500 in cash plus a fully paid entry into the 2018 Woodbine Mile Handicapping Tournament. Prizes will also be awarded to the second and third place finishers in the Series. TORONTO, June 30 – One of the sharpest tournament players in Canada—and throughout North America, for that matter—is Allan Schaffer of Toronto. Since winning a Woodbine tournament in 2005 that earned him $25,000 andhis first NHC berth, the 67-year-old commercial real estate executive has qualified seven additional times for the prestigious Las Vegas tournament, and he has also played in four Breeders’ Cup Betting Challenge events. Along the way he has also made many scores at the betting windows, pulling down a $32,000 Pick Six and several five-figure Pick Fours. At last year’s NHC, Schaffer finished 47th in the field of more than 600 entries and earned $10,500. He also has won a competition at Surfside in California and has scored a couple of online wins in addition to his Woodbine triumph. But ask him what his most lucrative cashes have been over the years, and he’ll tell you not about winning horses, but about winning people. Schaffer plays in most contests in partnership with his close friend Lorne Weiss. That camaraderie is a big part of what makes contest play appealing to Schaffer who, when not playing in the Woodbine Club, favors tournaments at Santa Anita so he can combine contest fun with a visit to see his daughter (a Netflix executive) and his four-year-old grandson in Los Angeles. Schaffer discovered horse racing back in 1966 when he was vacationing with his friend in Lake George, N.Y. and tagged along on an afternoon trip to Saratoga. Before long, he became a once-a-week player and, as his real estate career grew more prosperous, he delved into owning and breeding. His supportive wife Robin bought him a piece of a horse for his 50th birthday to get him started. Schaffer had what he considers modest success as owner and something less than that as a breeder. Through it all, he always seemed to derive more fun, and better results, from the wagering side of the business. Then, in the early 2000s, he discovered Gulfstream Park’s Turf-Vivor contests and enjoyed both the competition and fellowship of those events. That led to his participation—and eventual $25,000 victory—in the 2005 tourney at Woodbine, and suddenly an avid contest player was born. When playing tournaments, Schaffer does not skimp on doing his homework. For racing fans contemplating a first foray into contests, Schaffer believes that Woodbine’s modestly priced events are a great place to start in order to get the feel of live competition without having to put up an overly expensive entry fee. Schaffer will be a familiar face at the Woodbine tournaments this year as he seeks to qualify yet again for the NHC and BCBC. And while he wants to win, he also hopes for additional competition in the form of new faces taking part in the very vibrant Woodbine contest scene. TORONTO, May 26 – The name Ali T. Aksoy is becoming an increasingly familiar one in handicapping tournament circles. The Toronto resident has had a pretty darned good 2017—even if outright victory has eluded him thus far. In fact, the 70-year-old native of Istanbul, Turkey claims to have never—ever—won a tournament of consequence. “I’m always second,” Aksoy says with a chuckle. Last April, even a second-place finish was beyond the reach of the retired civil engineer/exporter/translator at Keeneland in the Keeneland Spring Challenge and the Keeneland Grade One Gamble. But his 6th place finish in the Challenge and his 9th place effort in the Gamble made him one of the first 2017 players to earn two entries in the 2018 National Horseplayers Championship (NHC). 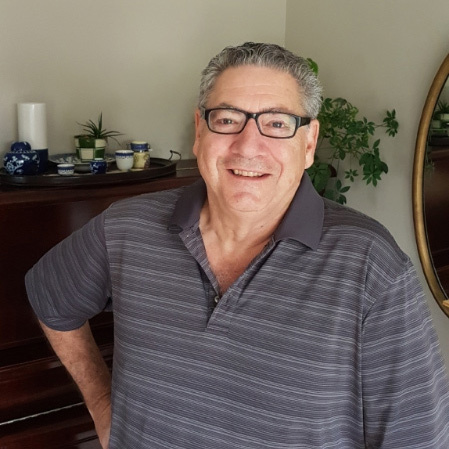 The good-but-not-perfect finishes continued a trend that has both frustrated and amused the affable Aksoy, who first came to America from Turkey in the early 1970s to earn his M.B.A. degree at the University of Pittsburgh. Aksoy’s penchant for getting nailed at the wire has extended even to his dalliances with horse ownership. Despite not having visited the winner’s circle in North American contest circles, Aksoy’s name has appeared frequently near the top of leaderboards at numerous live and online contests over the past year. And he has done very well wagering—both here and in his native country. Though it was in the U.S. that Aksoy was first bitten by the racing bug. “While studying at the University of Pittsburgh, some friends went to the harness races at The Meadows, and I went along. One of the guys– a devoted, revolutionary Marxist—was a big racing fan, and it wasn’t long before I got hooked. I did well enough that I began to wonder why I was spending all this time studying when such profits were there for the taking at the harness races. This proved to be a misconception, of course,” Aksoy deadpanned. After working some eight years for a steel fabrication construction company near Pittsburgh, Aksoy returned to Turkey where he began a successful enterprise exporting wild mushrooms (“Local people didn’t eat them, but they were a delicacy in places like France and Switzerland.”). Following the lead of his countrymen, Aksoy threw himself into the Turkish Pick Sixes—offered on both local and international races—and hit several of them for a total of approximately $200,000. It was in 1987 when Aksoy, a regular business traveler to Toronto, played in his first-ever handicapping contest. It was at Greenwood, and he finished second (of course!) in a field made up of both serious handicappers and media celebrities. In subsequent years, however, contests never really took root in Aksoy’s mind—in part because he spent so much time in Turkey during the period that the NHC and other big events were gaining popularity in North America. It wasn’t until two years ago—when he was working in Toronto translating legal and technical documents—that Aksoy went to Woodbine and played in his second-ever handicapping tournament. “All I got was a free lunch,” said Aksoy of his luck that day. 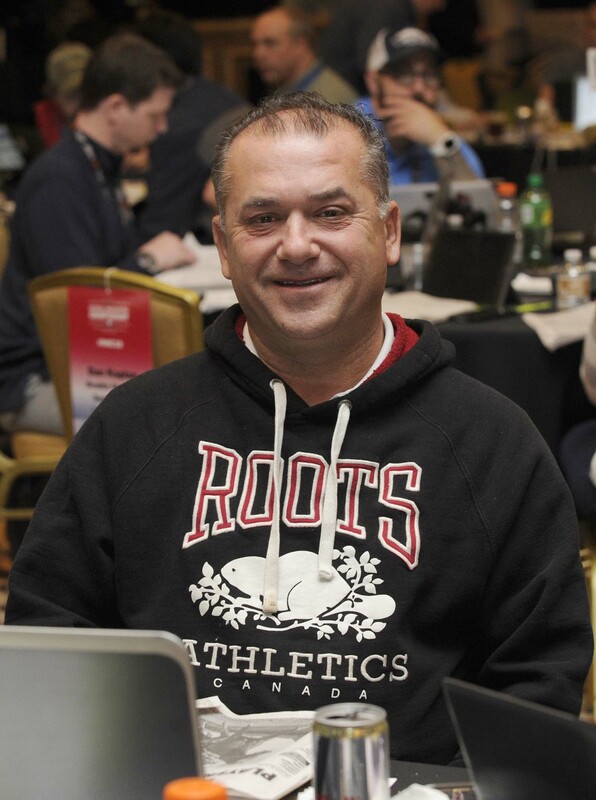 But rather than wait another 28 years for his next contest, Aksoy was back at it at Woodbine the following year and this time his results were markedly different–finishing second in the July Mid-Summer Tournament and earning his first ever trip to the NHC. How did he do last January in Las Vegas? Aksoy sums it up in one word: “Terrible”. But he learned an important lesson there that has served him well in the days since. What does Aksoy focus on when studying the past performances? In the broadest sense, he is looking for races in which he believes the expected value of a wager will be positive. “You can pick a lot of winners and still go broke,” he warns. To advance his quest for positive expected value, he assesses three basic elements. This isn’t to say that Aksoy is only looking for longshots. If he deems a horse to have an 80% chance of winning, he will bet—and bet big—on a horse that is even money. And this approach is a key aspect of his tournament strategy. In 2017, that approach has served Aksoy very well. His entries to the NHC already earned, he still plans to play all four tournaments this year at Woodbine (June 24, July 29, August 26-27, September 16) in order to earn additional NHC Tour points that can mean significant bonus money. And with respect to the August and September competitions, Ali hopes to win his first-ever entry into the Breeders’ Cup Betting Challenge. The goals seem very realistic and fitting for a man who has devoted so much of his life to education, and to then successfully putting that education into practice. TORONTO, April 28 – Take a passion for horse racing, an unabashed enthusiasm for contest play, a love of travel and the time and means to engage in all of the above and what do you have? You have 2016 NHC Tour Champion Cheryl McIntyre. A 66-year-old tire industry retiree from Massillon, Ohio, McIntyre hit the road—and her laptop computer—to participate in some 200 live and online competitions last year. Her prolific play led to two NHC seats, an incredible five Breeders’ Cup Betting Challenge entries, and earnings of approximately $145,000—including $95,000 in bonuses for her exploits as the top points-earner during the 2016 NHC Tour season. Indeed, it was easily the best year of her tournament career, which began eight years ago and has seen her participate in the last eight NHCs as well as five editions of the BCBC. She estimates she has won roughly 100 tournaments in all (counting online events) and earned a total of about $250,000 (U.S.). McIntyre is well known in tournament circles not just for her frequent play, but for her traveling “team” that includes husband Mike, brother-in-law Robert, son Kevin, Kevin’s girlfriend Jill and friend Gary Johnson, who recently returned to the training ranks on the Ohio circuit. Her extensive tournament travels have taken her from Laurel to Lone Star to Los Alamitos and a host of places in between. But one of her favorite stops—not just in 2016, but every year—is Woodbine, where she hopes to play in all four of the big tournaments this year (June 24, July 29, August 26-27, September 16). Yes, she thinks Woodbine is beautiful, and that the people there are great—and it’s not a bad drive from Ohio. But for Cheryl, her fondness for Woodbine goes deeper than convenience and mere niceties. And that comfortable feel that Woodbine affords Cheryl is doubly important to her given that she is not one to bury her head in past performances for hours in advance. When it comes to her beloved turf races, Cheryl is not fussy about distance, but she is pretty particular about everything else. Another thing Cheryl has become very adapt at is multitasking—namely, at competing in online tournaments while playing at a live, onsite event. Don’t let appearances fool you, though. When the competition is on, Cheryl has a competitive streak that often belies her calm demeanor. “If I get beat at the wire, I have been known to make some…cursing mistakes,” she said, laughing. A more serious peeve for Cheryl is when she is confronted—in person or, more often, online—by those who see her success and assume that, because she is a woman, she is not a serious handicapper or that someone else is making her picks for her. A lot of top tournament players didn’t know that about Cheryl McIntyre at this time last year. They do now. McIntyre all smiles after another tourney score! 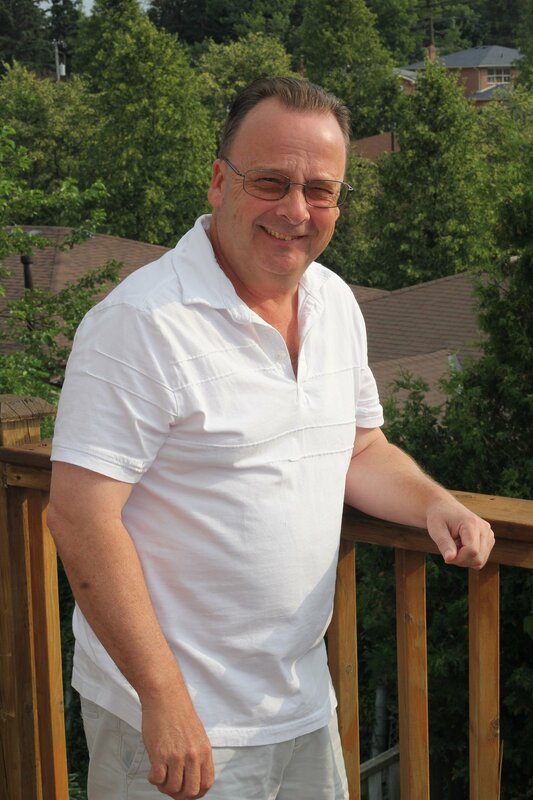 TORONTO, March 31 – Ask 2010 National Handicapping Championship winner Brian Troop what the secret has been to his success as a tournament player, and you’ll get a chuckle in return. Many of his peers would beg to differ—at least with respect to the part about him not doing anything special—because his results have been far from ordinary. In 2010, at Red Rock Casino in Las Vegas, Troop won $500,000 as NHC champ. Then, again at the NHC in 2015, Troop became the first previous NHC winner to earn a seat at the event’s newly-instituted Final Table (a feat matched this past January by 2003 winner Steve Wolfson Jr.). Troop could only manage a 9th-place finish that year, but that was still good for a more-than-worthwhile payday of $52,000. The 2017 NHC represented the opposite end of the spectrum for Troop. He was forced to watch it from the sidelines, having failed to qualify for last January’s event. But he was, nevertheless, in attendance at Treasure Island and was both pleased and proud to see fellow Ontario native Ray Arsenault (of Thornhill) capture the top prize, now worth $800,000. And in 2018, that could, in fact, happen because Troop recently qualified for next January’s NHC (it will be his eighth NHC appearance—all since 2009) via an online qualifier at HorseTourneys. “It was good getting that out of the way for sure,” he confessed. For the balance of 2017, Troop will focus on tournaments he traditionally enjoys playing, including those at Hawthone and Woodbine. His primary goals are to earn a Breeders’ Cup Betting Challenge berth (he has previously played in 2010 and 2016) and, if possible, a second entry to the NHC. Interestingly, his strategy varies very little whether he is playing in a major onsite tournament or wagering on simulcast races from nearby Georgian Downs (which he does on an almost daily basis). How Troop arrives at the horses he does, indeed, like is where the old-school nature of his handicapping really applies. Rather than rely on high-tech software as many high-volume tournament players utilize today in order to quickly sift through a plethora of races, Troop prefers a more old-fashioned approach. Troop does allow himself the technological edge that readily available race replays offer. He is an ardent race watcher—and re-watcher—and when he sees a horse experience a noteworthy trip, he enters the horse’s name in a book…old-school accountant-style. Troop’s final step before pulling the trigger on a wager is to look at the horses in the post parade and review late odds fluctuations. It is important enough to Troop that he strongly prefers live-format online tourneys rather than ones that require all selections to be entered prior to the first contest race. Troop was first exposed to the races way back in 1969—long before contest play had even been devised. He was articling to become an accountant at the time and would tag along with his landlady’s son, who was a bookie, to Greenwood to play the harness races. Troop quickly became enamored of handicapping, and he especially enjoyed winning longshot bets rather than simply getting paid 11-10 on the sports bets he occasionally made with his bookie friend. But it was not until 2000 that he played in his first tournament. Thanks to his $500,000 NHC windfall in 2010, Troop is officially retired now, and he plays the horses on a near-daily basis. Other than handicapping, his primary interest is following the stock market. “I need at least one or the other to be going well, or else I’m in trouble,” he laughed. It’s not clear how Troop ranks as an investor, but a great many horseplayers would love to have Troop’s earnings and his record of accomplishments as a tournament player. His style may not be flashy—but it has gotten the job done. Troop in the trenches at NHC! TORONTO, February 24 – For the second time in the event’s 18-year history and for the second time in the last seven years the NTRA National Handicapping Championship winner hails not just from Canada, but from Ontario. In 2010, it was Barrie’s Brian Troop who did Canada proud in Las Vegas, and last month it was Thornhill’s Ray Arsenault. The 64-year-old transportation broker started slowly on the first day of the three-day tournament, but he amassed the highest Day 2 score to take the lead, and maintained the lead for the majority of Day 3, sealing the victory with a strong final table performance to earn the $800,000 (U.S.) top prize and an Eclipse Award as North America’s Handicapper of the Year. “It’s been amazing,” said the affable Arsenault of the support he received from family and friends back home both during and since his big win at the NHC. “I’ve received so many emails and texts and phone calls. The Toronto Sun reported on my win, and the Canadian Press did an article on me. A year earlier, at NHC 17, Arsenault won $16,500 for finishing in 26th place, but the final day was largely a disappointment for him, failing to make the Final Table of 10 after unsuccessfully seeking out clever longshot plays early on Day 3. This time around, Arsenault entered Day 3 in first place, and he shrewdly calculated that it was unlikely he could fall out of the top 10 by the mid-day cutoff point for the Final Table. So he put virtually all of his study into the seven mandatory Final-Table races and made his 10 early-day optional plays almost by the seat of his pants, going on a race-to-race basis to come up with horses he thought could help him pad his score. He didn’t set the world on fire with those early Day 3 plays, selecting just three runners up, but no one else in close proximity to Arsenault in the standings was doing unusually well either. The paucity of winning longshots, combined with those three place payoffs, kept Arsenault atop the leaderboard heading into the seven Final Table races. He had studied the remaining races carefully and stuck to his guns on the horses that had caught his eye earlier. The preparation paid off with two long-priced winners and another longshot place horse that propelled him to a record NHC total (mythical $2 win/place payoffs) of $407.70, more than $46 ahead of the runner up, former NHC Champ Steve Wolfson, Jr. In addition to the $800,000 grand prize, Arsenault’s victory also earned him an automatic berth as defending champion into next year’s NHC. Nevertheless, Arsenault envisions that his path to the 2018 NHC will be quite similar to that which led him to the 2017 NHC. Like many tournament regulars, Arsenault enjoys the live bankroll format employed by Woodbine, and last year he encouraged Carmen Day, Woodbine’s Vice President of Guest Experience, to run even more such contests. “Carmen does such a great job there,” Arsenault said. “She was out at the NHC rooting me and all of the Woodbine qualifiers on and helping to keep us organized. This year Woodbine has a new tournament in June, and another in July. I plan to be at both. Many top players in addition to Arsenault undoubtedly have the Woodbine tourney dates (June 24, July 29, August 26-27, September 16) marked on their calendars. But what about the racing fan who is new to contest play? Does the NHC champ have any advice for those looking to dip a toe into the water, as Arsenault himself did back in 2004 only because an uncle happened to be playing in a contest at Woodbine? For those who find the live-tournament entry fees (Woodbine’s range from $150-$3,500) a bit steep, Arsenault suggests trying an online qualifying site. It certainly was Ray Arsenault’s “day” in Las Vegas last month, one that will now live on in handicapping contest history.